I usually consider myself to be a “lavender” girl. The scent of lavender makes me feel relaxed and rejuvenated. However, I just realized that I have a lot of love for roses too! 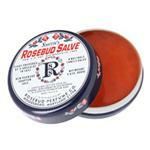 I can’t live without my Rosebud salve. At any given time there are three or four containers scattered around my house and in my purses. I use it on my lips and cuticles. Once I was in a jam, and I even used it for my daughter’s diaper rash! Rosebud salve has been a staple in my life since college when my dear sweet friend E.Boone introduced it to me! Right now it can be found on drugstore.com for only $5.59. Speaking of E.Boone (who happens to be a beauty editor at a well known magazine…), while in college she also introduced me to using Witch Hazel as an astringent. We both were using Dickinson’s which has kind of a weird campfire smell. After becoming used to it, I loved it! 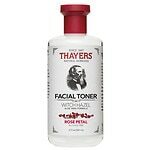 About six months ago I started wearing Thayer’s alcohol free Rose Petal Witch Hazel, and I am IN LOVE! It smells so luxurious and just like fresh roses. Since there is no alcohol in it, it makes my skin feel clean and moisturized! I usually buy it at Whole Foods for about $9.99 a bottle, but I just found it on drugstore.com on sale for $7.99! ← Kensington Salt and Pepper Set only $10.96! Sale ends at midnight tonight! Thanks for the shout outs!!! I am a total rose girl. Never tried the fresh shampoo, but they do have a fragrance, cannabis rose, that smells divine!